Kathy Delzell Anderson and Steve Anderson created a fellowship fund hoping to advance pediatric allergy research. Photo by Daniel Dubois. Kathy Delzell Anderson and her husband, Steve, know firsthand how allergies can affect a person’s overall health and well-being. Kathy is a lifelong allergy sufferer, and their son, Clint, has seasonal allergies. They are among the large—and growing—number of people who are impacted by at least one allergy. It is believed that allergies affect as many as 40 to 50 percent of all children worldwide. In the United States, one in 10 children has asthma, making it the third most common chronic disease in children younger than 18. Potentially deadly food allergies affect one in every 13 children, according to the American Academy of Allergy, Asthma and Immunology and the Asthma and Allergy Foundation of America. The Andersons expressed interest in getting more information and first met with Vanderbilt clinicians Scott Smith M.D., Ph.D., Mark Wurth M.D., Ph.D., and Yasmin Khan M.D. They later spent time with Paul Moore, M.D., director of the Division of Pediatric Allergy, Immunology and Pulmonary Medicine, and learned more about Vanderbilt’s Pediatric Allergy and Immunology practice, which sees more than 4,000 patients a year and treats a broad range of allergic conditions, from common environmental allergies to the most complex disorders involving the skin and respiratory and gastrointestinal tracts. The Andersons are concerned that funding sources for cutting-edge research have become much more competitive and difficult for researchers to secure. 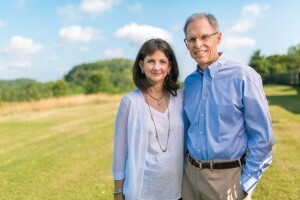 In hopes of advancing allergy research, the Brentwood, Tennessee, couple has established the Kathy Delzell Anderson and Stephen J. Anderson Fellowship Fund, which will support post-residency pediatric fellows in the Allergy-Immunology Fellowship Training Program at Vanderbilt University Medical Center. This newly established fund will enable the division to support fellows as they pursue specialty training. In addition to launching this endowed fund with a gift, the Andersons also chose to make a gift in their will to grow the fund in the future. A fellowship is a specialty training program that enables physicians who typically have completed their residency to subspecialize in various areas of medicine. “Fellowships are incredibly important because they enable young physicians to subspecialize in different areas needed to care for the incredibly complex patient population at Vanderbilt,” said Moore, associate professor of Pediatrics and Pharmacology. Additionally, the fellows will be actively engaged in research projects.